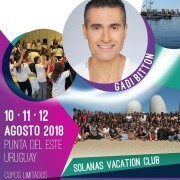 del 10 al 12 de agosto se realizará el 5º ROKDIM.UY - Camp Internacional de Rikudei Am en el Solanas Vacation Club en Punta del Este/Uruguay (www.solanasvacation.com.ar). El éxito de las ediciones anteriores nos hizo reforzar nuestro entusiasmo en volver a reunir rikuderos de toda la región para seguir fortaleciendo lazos en nuestra cultura judía. Este año contaremos con la presencia del carismático markid y coreógrafo israelí Gadi Bitton quien nos deleitará con sus nuevos rikudim. El Camp está dirigido a bailarines de talleres y lehakot y nos gustaría mucho poder compartir esta vivencia con ustedes. Los esperamos con mucho gusto y queremos contar con tu presencia para así poder seguir enriqueciéndonos a través de nuestra danza. From the 10th to the 12th of August - 5th ROKDIM.UY - International Camp of Rikudei Am will take place in the Solanas Vacation Club in Punta del Este / Uruguay (www.solanasvacation.com.ar). The success of the previous editions made us reinforce our enthusiasm in bringing together dancers from all over the region to continue strengthening ties in our Jewish culture. This year we will have the presence of the charismatic Israeli markid and choreographer Gadi Bitton who will delight us with his new rikudim. The Camp is aimed at dancers of workshops and lehakot. We would like very much to share this experience with you. We look forward to seeing you and we want to count on your presence so we can continue enriching ourselves through our dance.